Instead of £125.00. You save £6.25 due to the online discount . If you regularly need to block off particular access points or delivery areas, installing a fixed wall belt has many advantages. 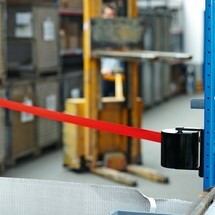 When not in use, the barrier belt is securely stored in the cartridge, saving space. The aluminium mount for the belt cartridge is firmly screwed into a wall, ensuring a reliable hold. The well-protected barrier belt is available in a variety of colours and lengths. Choose between 2.30 m, 3.70 m, 10 m and 20 m in different, clearly visible signal colours. The centrifugal brake integrated in all versions ensures the controlled return of the belt. Thanks to the magnetic end piece, you can attach the belt to any appropriate surface, thereby avoiding the need for a fixed wall mount. This makes this barrier system particularly flexible, which is further supported by the rotating cartridge for the 10 and 20 m models. 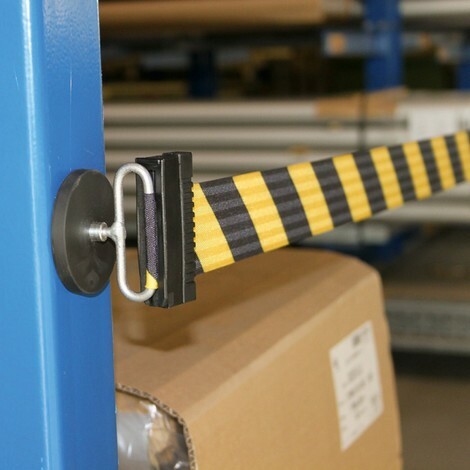 Design your permanently installed barrier system as flexibly as possible and order the versatile barrier wall belt with magnetic end piece from our shop.